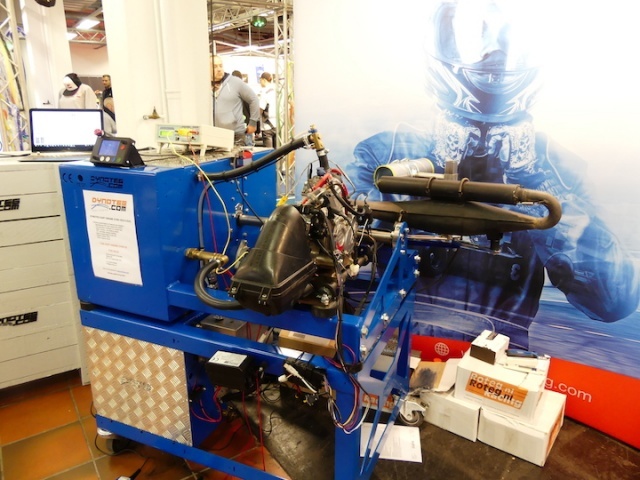 In Offenbach, the Dutch company Dynoteg has unveiled the latest version of its eddy current kart engine dyno test bench: the Ked-5 Evo. Among the indispensable tools for a state-of-the-art tuner, the test bench remains the most essential. Why it is good to have one as good as the competitions, and the model presented by Dynoteg in Offenbach is one of the most modern available. This model by the Dutch company is in fact an eddy current engine dyno made specific for kart engines, which in the case of this Ked-5 Evo model offers a very compact design but also very fast and precise check up. By using foot controls you can conduct tests in the traditional way, but it is also possible to conduct tests in an automatic and parametric way (individually varying the maximum and minimum speed, or cycles, time and so on); moreover by simulating various tracks, with data imported directly from your data acquisition tool we normally mount behind the wheel. Various accessories are available, such as different sensors (also lambda) as well as electric starter, water preheater, weather station, exhaust gas extractor and so on, up to the chain-toothed belt transmission kit, more consistent in measurements. It is interesting to note that in order to directly verify the proper state of the test bench, the Dynoteg technicians used it to develop an indirect fuel injection system, mounting it on a Rotax Max engine in substitution of the carburetor, with which they were able to get the Austrian engine to reach 15,000 rpm.